Now that I am older I just don't enjoy venturing out into the chaos of New Year's Eve – the crowded restaurants and clubs charging double and triple what it normally costs. The loud noise called music. Elbow to elbow with people I don't know. But most importantly I can't stand leaving Morgan all alone at home.So now I celebrate New Year's by going to bed at midnight – East Coast time, as many of you know we live in California, and getting up early New Year's Day and having the world to ourselves. It's become a New Year's Day tradition to take an early morning hike with my dog. One of my most memorable New Year's Day hikes was to Pt. Reyes National Seashore in Marin County, in Northern California, across the Golden Gate Bridge, to watch the whales migrating. My dog loved being out in the cool crisp morning air. In the winter the sky is deep blue and the sun sparkles on the water. Since moving to Southern California I've continued the tradition and my favorite New Year's place is hiking in Whitewater Preserve, 2800 acres of wilderness, just a few miles north of Palm Springs. The ranger station is closed on New Year's Day, along with the parking lot, so it limits the visitors. But we park down the road and walk in and have the place all to ourselves. Morgan loves the open space and the cold mountain water streaming along. 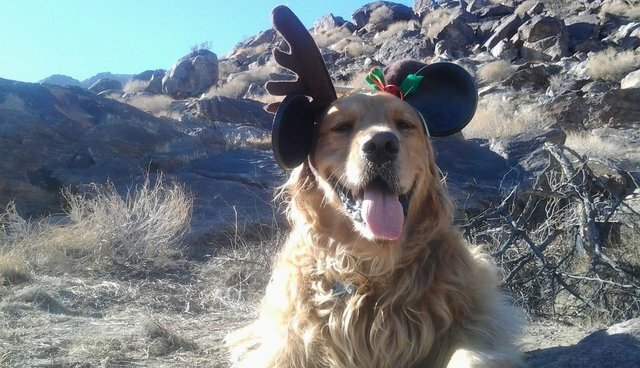 In honor of our hiking tradition I'd like to leave you with a 'hiking tail' called "Morgan the Magnificent" that some readers may have read on my Facebook Page – Rescued by Goldens. But I write here the complete unabridged version. As the morning mist lifted, the creature came into clearer view. His antler was on the right side which indicated a male. On females, the antlers are on the left. From the size of the antler the creature must have been 4 or 5 years old. They're known to live for ten or twelve years. His fur was gold colored and radiated in the morning sun. Despite his regal-ness, the animal had a perpetual smile on his face and seemed unabashed by his odd evolutionary departure from his Northern two-antlered reindeer ancestors. We named him "Morgan the Magnificent." Our pets are in our lives for so short of a time. I encourage everyone to cherish them even more in the coming New Year. They are all magnificent and deserving of unconditional love back. I dedicate this New Year's blog to all of our special friends who have crossed that Bridge this past year. Morgan and I wish everyone a happy and healthy, a peaceful and prosperous New Year.